Thunderbolt on Windows has been a bit of a disaster but Intel is determined to do something about it and let PC users experience the joys of connectivity that Apple users take for granted. 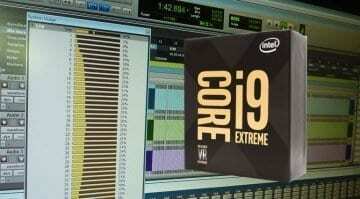 And so Intel has announced that chip makers and manufacturers can now incorporate Thunderbolt technology royalty free. This all ties into the pending release of the USB 4 specification which is based upon the Thunderbolt protocol. 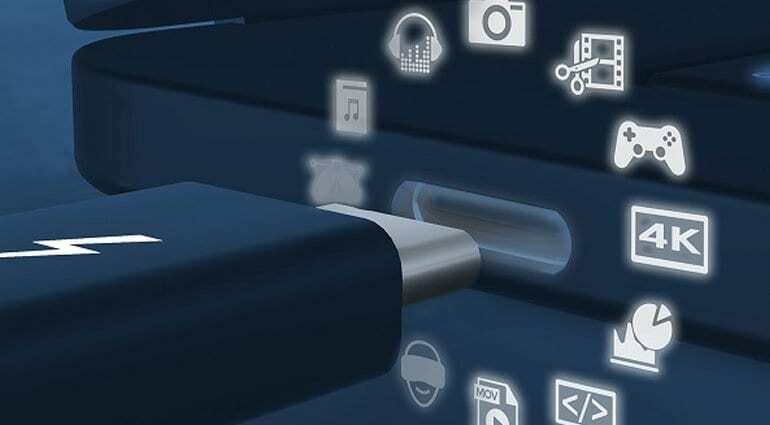 This convergence will increase the compatibility among USB-C devices and hopefully clear up all the confusion over what protocol is lying behind the port. When faced with a USB-C port you have no clue as to what’s behind it and the chip makers ideal of having one port to rule them all was completely destroyed by the confusion between Thunderbolt and USB. Now, hopefully, they are sorting themselves out. 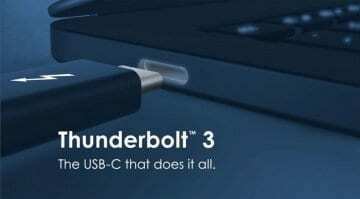 The problem for Windows users has been that USB is dead cheap to implement whereas Thunderbolt is not and so, unsurprisingly, the premium Thunderbolt port was rarely found on PCs. 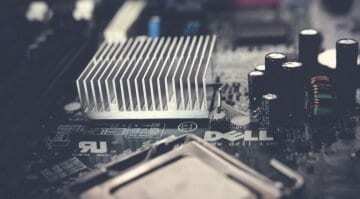 And then it’s not just a matter of adding an expansion card, the technology had to be built into the motherboard and so it would only appear on high-end boards and you’d need to buy an expensive card just to enable it. And the implementations appeared to be different on different boards from different manufacturers. 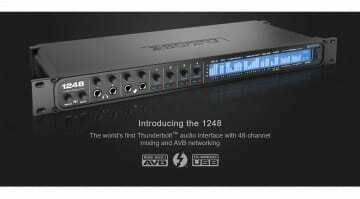 Pro Audio companies such as UAD and Focusrite found themselves having all sorts of problems with the wrong sort of Thunderbolt or the wrong adapter cables. It was just a mess and us Windows users could only look on in envy as more tasty Thunderbolt audio interfaces and peripherals started to arrive. Intel has previously announced (2 years ago) that they are building Thunderbolt directly into the processor so that no one has any excuse not to make use of it. This will be realised in the forthcoming “Ice Lake” processors announced at CES 2019. 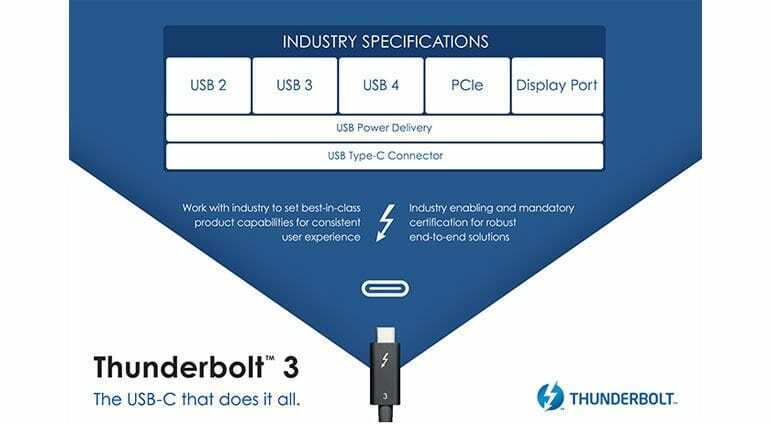 This implementation of Thunderbolt 3 will support USB 2, 3 and 4 plus PCIe and DisplayPort so you won’t have to worry about what is or is not behind your USB-C port. That would be awesome. To have hassle-free ports, like we used to with regular USB, would make all our lives easier and with TB3 it should be smoother, faster and groovier as well.